This field controls how many records are returned by any single fetch-xml call. This is specific to North52 with the default value set to 250 records. This allows us to break up large queries of say 1+ million records into small chunk sizes which helps to keep us within the 2 minute platform timeout. A flag that indicates the Schedule should stop when it is set to Yes. Lookup field to a parent Schedule if this one is a child Schedule. A delay period in milliseconds between each record that gets processed. Allows you to set the maximun number of times this Schedule will execute. N52 Schedule is the default setting and performs 1 processing step within the main North52 BPA workflow. N52 Schedule Extended performs 25 processing steps within the main North52 BPA workflow. The number of times this Schedule has executed. Indicates the next time the scheduler will execute this schedule. If this datetime is in the past the Scheduler will execute immediately when started. When processing large amounts of records you might see this field with times in the future but not on the user defined Scheduled time. This is because the current Schedule iteration is still 'in-progress' and pauses itself by pushing this field 1 hour into the future therefore staying within the Dynamics 365 platform limitations. It will continue this pausing technique until all records have been processed and then will revert back to the user defined Schedule. On long running Schedules this allows us to set the next run datetime correctly. Allows you to sync. your CRM platform setting for this query limit defined by Microsoft which is set to 5,000. Allows you to sync. your CRM platform setting for infinite loop detection. The default set by Microsoft is 8 so this field defaults within a schedule to 8. Note that this can be set to 16 for CRM Online. If you are using an on-premise/IFD installation you can increase the 'MessageProcessorMaximunDepth' setting to allow for more recrusive calls if required. (Internal) When a fetch-xml query exceeds the page record count this is save to the Schedule record so we can page into the next set of records. This allows the Scheduler to process an unlimited number of records. Think billions of records. Allows you to sync. 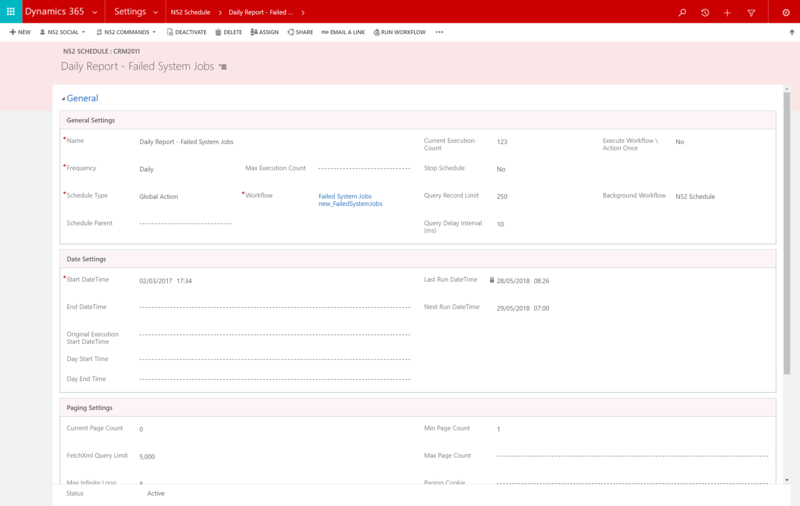 your CRM platform setting for minimim inactive seconds. The default set by Microsoft is 3600 so this field defaults within a schedule to 3600. If you are using an on premise \ ifd installation you can reduce the 'MessageProcessorMinimumInactiveSeconds' setting to allow for a schedule to be active for more than the default of 1 hour. Allows you to add metadata to your Schedule so you can categorise them. Allows you to add metadata to your Schedule so you can sub-categorise them. Determines which solution your Schedule record should be placed inside. Internal should not be manually edited. Use the lookup field.